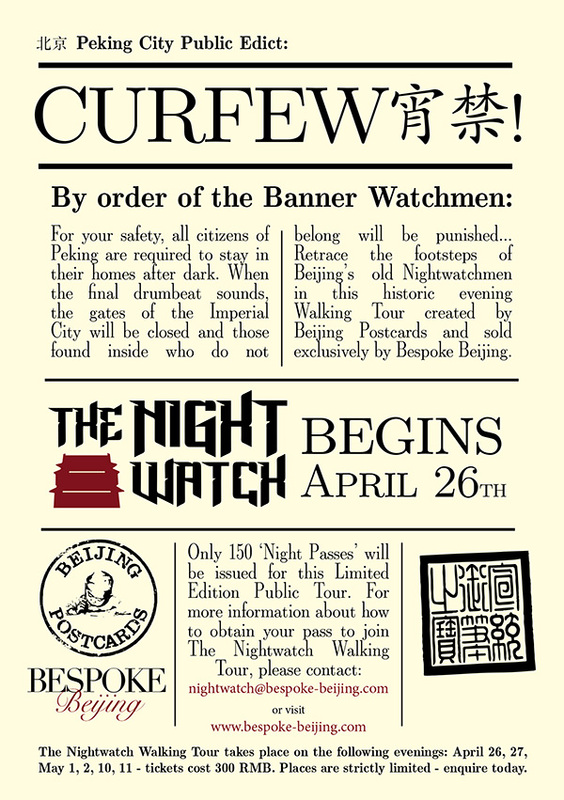 Here's a selection of my work on The Nightwatch, an after-dark guided tour of Beijing's old alleyways that traces the footsteps of a Qing Dynasty nightwatchman. (Still available for private tours, folks.) Guided walks are a fabulous way to get to know a city, particularly when created by someone with the historic smarts and charisma of Lars from Beijing Postcards. I worked with Beijing Postcards and Bespoke Beijing to create marketing buzz for a number of their walks (we called them 'Signature City Experiences'), designing posters, flyers, even videos to drum up the hype. Not forgetting the logo. Something snazzy, edgy, yet classy. Also these making-of videos interviewing Lars on his research processes, and repeated reference to the erstwhile Game of Thrones slogan, "the night is dark and full of shadows". Because, you know.